Step 1 Heat the oven to 200 degrees. Step 2 Cut the lemons in half lengthwise and then cut each half lengthwise into 6 to 8 wedges. Save any juices you get from cutting the lemons; set aside. Lay the wedges out on 2 paper towel-lined trays and place in the oven 1 hour. Step 3Grind the peppercorns, cumin, cardamom, cloves and cinnamon in a spice grinder to a powder. Transfer to a large bowl and add the cayenne, mace, nutmeg, carom seeds, red pepper flakes, asafetida, ginger and salt. Add the reserved lemon juice and mix well. Add the lemon wedges and mix, pressing the spice mixture onto the flesh of the lemons. Step 4Pack the lemons into 1 clean (1-quart) jar and 1 clean (1-pint) jar. Cap the jars and set in a sunny window for 5 weeks, turning the jars up and down several times, 3 to 4 times a day. 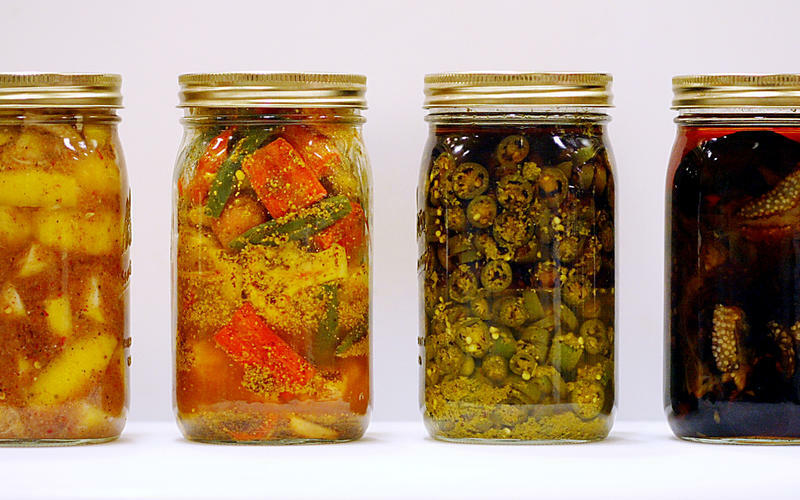 Let the pickles age at least another month before eating. Refrigerate after opening. In Recipes-list.com we have selected the most viewed recipes from category - Sauces and condiments . Enjoy the best recipes specially selected for you! Sour Lemon Pickle is the right choice that will satisfy all your claims.